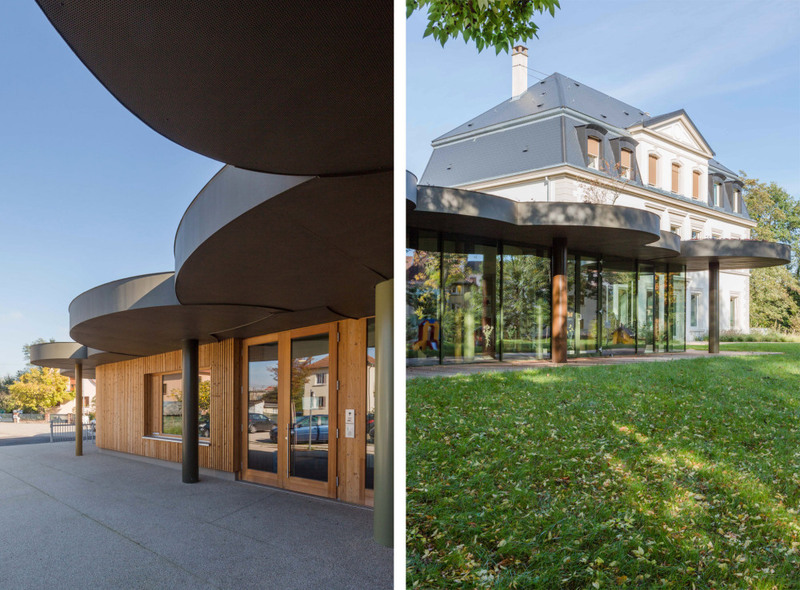 STRASBOURG / At the centre of a park, the renovation and extension of this mixed-use community centre strengthens the intergenerational bonds between seniors and young children. This building, dating from 1900, was converted into an intergenerational community centre in the 1960s. However, it had since fallen out of use as it did not meet current building codes. 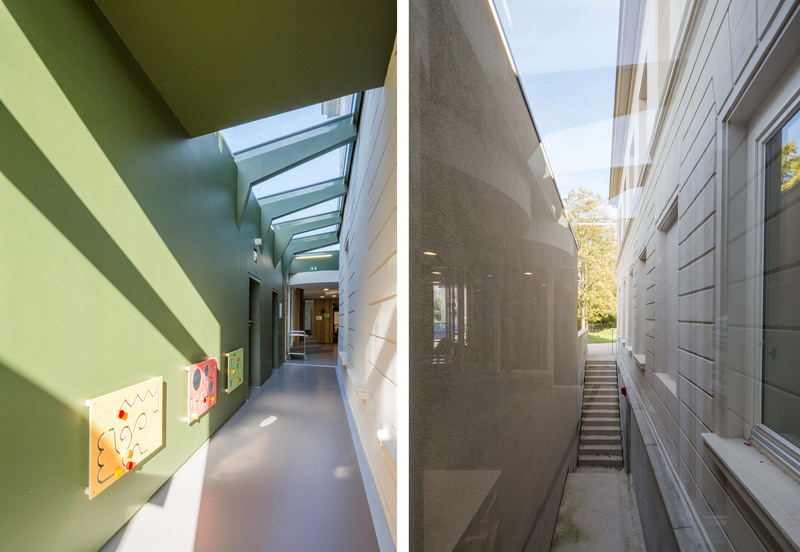 The design brief of tripling its capacity (20 to 60 places), in harmony with the housing for the Seniors and Retirees Association, required a complete redesign of the existing structure (1,000 m2) and an extension (1,500 m2). The architecture has restored the original building to fulfil its main purpose as community centre as a heritage building, and integrated it into the surrounding gardens. Its new extension blends seamlessly into the landscape. 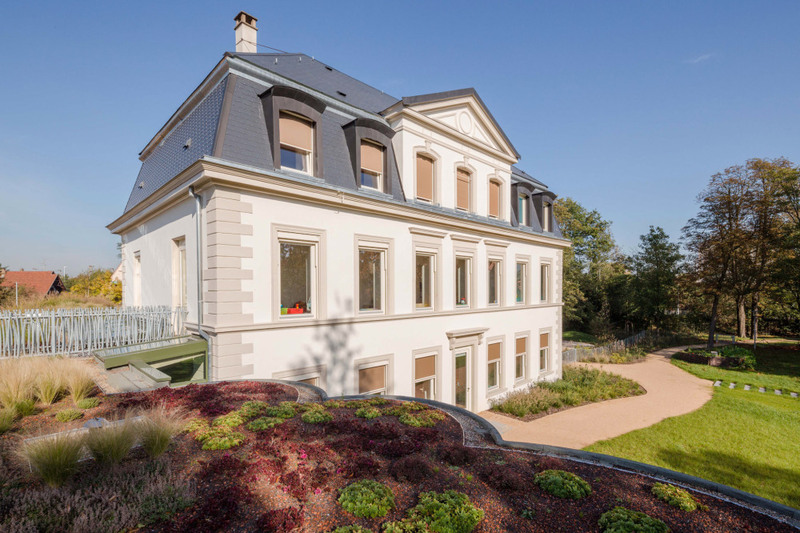 The project obtained French BBC certification (low-energy consuming building). Collective memory. 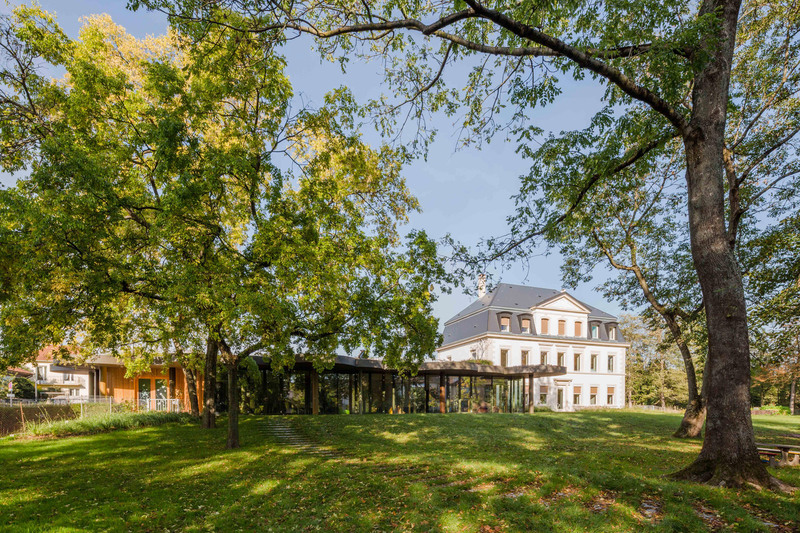 The villa has been an emblematic part of the Montagne Verte neighbourhood for over a century. 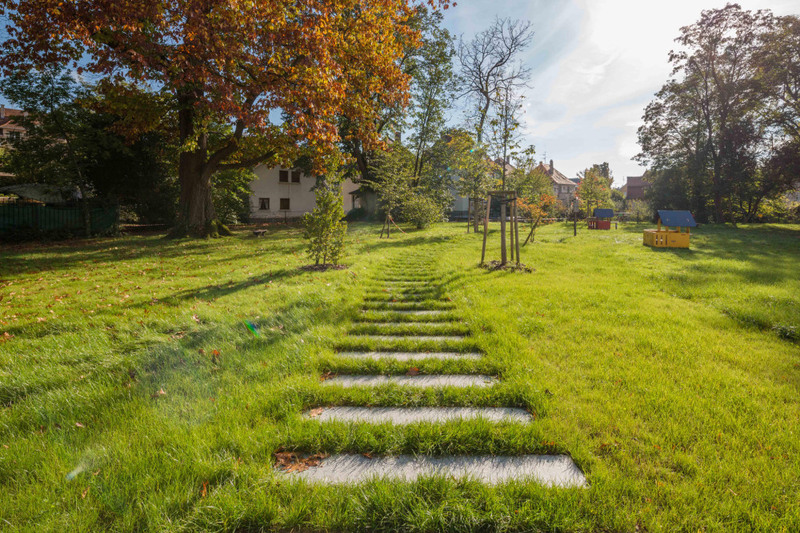 Yet over time, several attached units had been added to the mansion, which had a detrimental effect on the original building, its historical role, and its relationship to the exceptional surrounding green space (7,000 m2 heritage-listed). 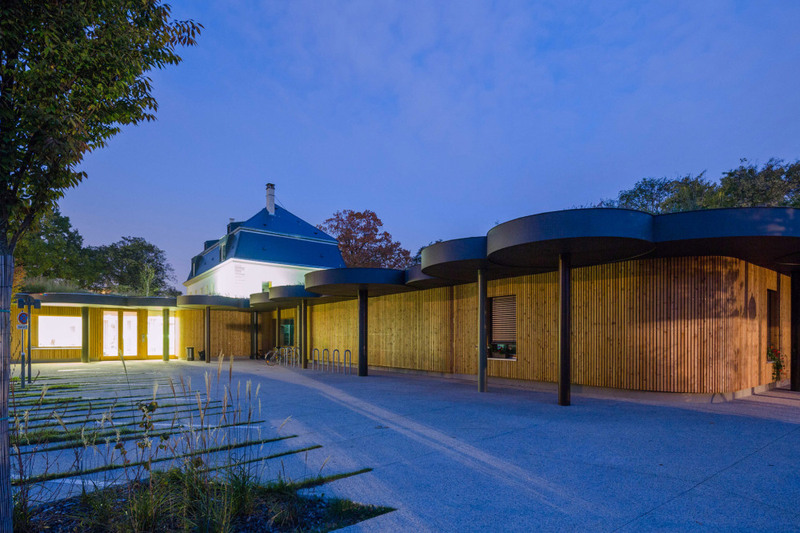 The design chose to restore the iconic couple formed by the old mansion and its grounds, while playing on the notions of transitions and boundaries. Mirroring. With this idea in mind, the additions were demolished and the extension was designed to blur the line between the villa and its gardens. Its low building height (one level) transmits the codes of its wooded surroundings. The green roof evokes a canopy, in addition to its core ecological purpose (such as thermal and urban air quality). The shaded and lively facades and wooden posts evoke an image of the forest’s edge. Inside, the suspended acoustic ceiling tiles in circles of various heights are reminiscent of the underside of tree’s crown. Forests and undergrowth through the trees … all serve as echoes of the imaginary world of children’s fairy tales. Intergenerational. This key concept in the community project inspired all the decisions for reorganising / creating spaces both inside and out. 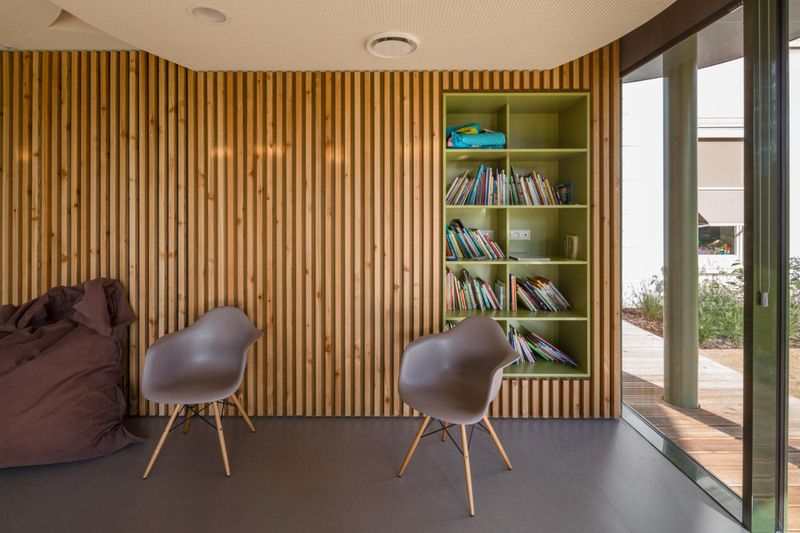 The villa includes a day care centre for infants and toddlers, with two sections on the first two floors and the third floor reserved for staff. The third living section is housed in a wing of the extension. The Seniors and Retirees Association has its rooms in the other wing; at the junction between these sections are common areas shared by seniors and children. Sustainable Design. Consistent with the site’s location and the architectural programme, the redesign and construction adopted eco-design principles: high energy performance certainly, but also the quality of materials, indoor air quality, water management, and acoustic comfort. 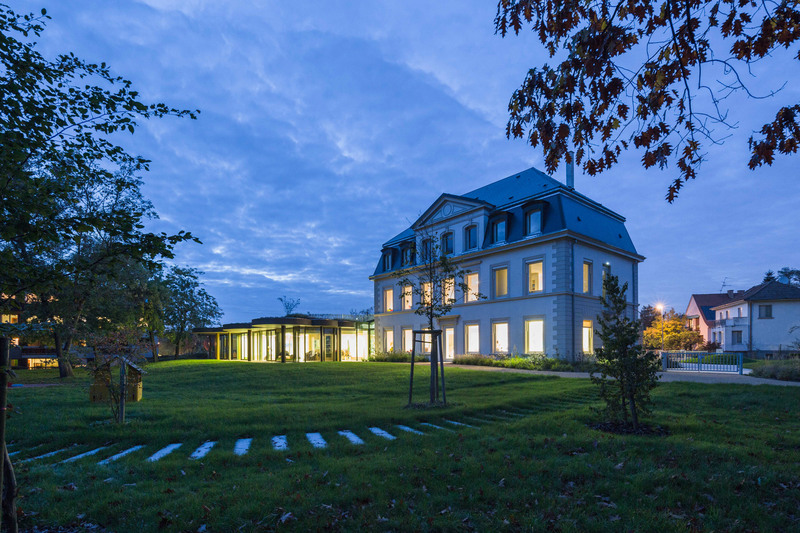 The project obtained French BBC certification (low-energy consuming building).